The Kingdom of Gwalior, whose capital lies south of Agra in the north of modern India, was ruled along with Ujjain by the Maratha Scindia dynasty from 1731, although after the defeat of the Maratha states in the Third Anglo-Maratha War in 1818 it was forced to recognise British suzerainty. Its native rulers however continued to hold local power until the creation of independent India in 1947. In 1843 however Maharaja Jankojirao II Scindia died, with his appointed heir Jayajirao still an infant of 10 years, and the Maharaja's widow, not Jayajirao's mother, was party to the instalment of a regency under the Prime Minister, Dada Khasgee Wala, that opposed the succession of the British-supported Jayajirao. A contemporary account exists by the later Baron of Aliwal of the subsequent British campaign that ousted Dada Khasgee Wala and emplaced the young Maharajah on his throne; it culminated in a decisive battle at Maharajpur. 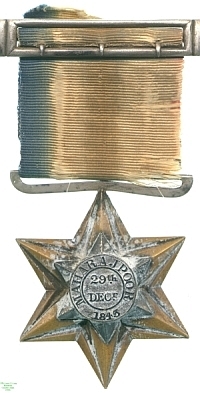 For participation in that battle, or another the same day at Punniar, this star was issued by the Honourable East India Company. 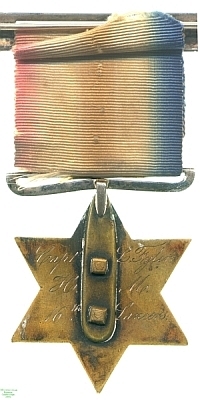 The main star was common to both awards; the inner star that specifies the battle for which the award was made is held in by nuts on the reverse. This medal was awarded to Captain Lawrence Fyler of the 16th Lancers, whose medal group has come entire into the Watson Collection and shows a career spent in India and the East fighting for the Crown from the 1830s to the 1850s. This medal is attached to two others and the catalogue of the Watson Collection considers it as part of Group 8 (this comprising two assemblages and two loose medals). For provenance of the group see those entries.